Almost as soon as there were cars, there were automobile deaths. Even before the turn of the century – the 1900s, that is – there were already people dying in automobile accidents, and it is no wonder why. 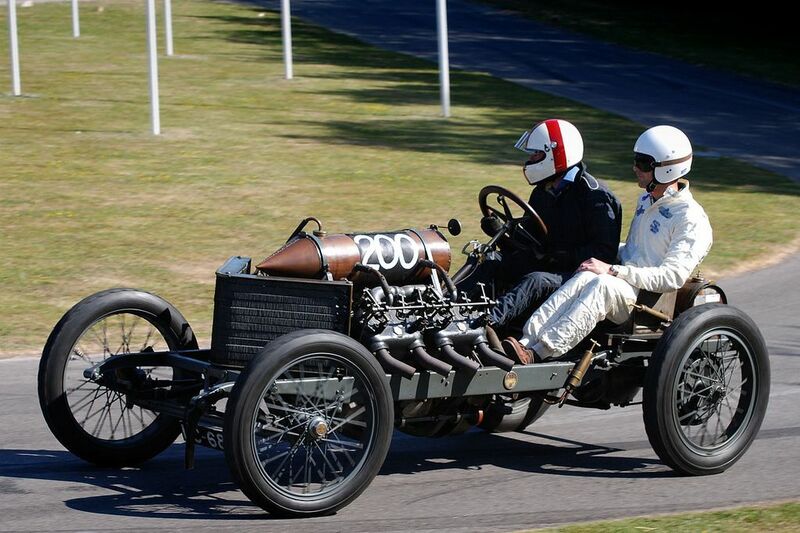 Early automobiles did not have the safety features that today we take for advantage. Forget anti-lock brakes and airbags, early cars didn’t have “luxuries” like headrests (not standard until the 1960s), safety glass (the 1930s), rearview mirrors (1920s), or seemingly mandatory things like brake lights, headlights and windshield wipers (all more or less introduced shortly after the automobile but took a bit of time to become standard). Heck, some early vehicles didn’t even have bodies on the cars (http://s-media-cache-ak0.pinimg.com/originals/fc/54/ca/fc54ca5a7712acacc1a1ff82032b253a.jpg)! Now imagine riding in one of these vehicles without a seatbelt, and it is fairly easy to see why the accident fatality rate in the United States was fairly high even though cars went nowhere near as fast as modern ones do. In fact, according to the National Highway Traffic Safety Administration, the first year (1921) that it had statistics for was also the most dangerous when considering the amount of fatalities per vehicle miles traveled (https://en.wikipedia.org/wiki/List_of_motor_vehicle_deaths_in_U.S._by_year#References). In that year, there were 24.09 deaths per 100 million miles driven. Today’s (2013) rate? 1.11. The rate has essentially been on a downward trend ever since it has been kept track off. Why the improvement? Well, there certainly isn’t any one thing that can be given full credit for this, especially since the data doesn’t differentiate on who is getting killed and how. However, undoubtedly the invention of the seat belt has played a major role in this, especially the three-point belt, which was patented in the United States on July 10, 1962, by Nils Bohlin (patent #3043625). Bohlin was an employee for the Volvo Car Corporation of Sweden. In fact, four years earlier, he had been named the first “chief safety engineer” of the company. For Bohlin, seat belt safety was a priority. It’s not that the belt’s didn’t exist, but there were serious problems with the design. The so-called two point belt, which fastened across the abdomen, was known to cause serious abdominal injuries in crashes. Bohlin’s new invention improved upon the design of the two point belt. In addition to having the lap belt, there was now a belt that came down from the shoulder to the lap – the design we are all familiar with today. The advantage of this design was that, in a crash, both the upper and lower body were held in place simultaneously, thus displacing the stress of the impact away from just one area. The new invention was an immediate success. Almost instantly, it became standard worldwide. In the US, it was a mandated part of vehicles beginning with the 1968 model year. Many governments have even made the wearing of seat belts to be mandatory. Why? Although Bohlin’s model has been redesigned slightly, it is basically the same today, and it is estimated that the three point belt reduces the risk of fatalities and serious injuries suffered during collisions by 50%. In fact, Volvo has estimated that seat belts have saved over 1 million lives. So, as you are taking your summer road trip this year, take a moment to both buckle up and say a word of thanks to Nils Bohlin, but also hope that his invention never comes in play for you. Wishing you a summer of fun and safe travels, from US Patent Services.